This tripod represents the top of the Manfrotto lightweight tripod range, providing professional photographers a tripod that is very light, compact, simple to use, yet high quality, strong and extremely versatile to position. To reduce the weight of the tripod without any compromises on stability and rigidity, the legs are made of unique, three-faceted carbon fiber tubes of 1.2 mm thickness combined with quick-action, magnesium and resin lever locks. 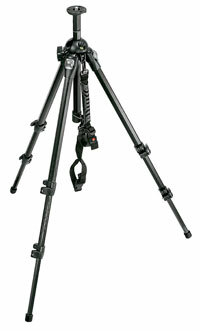 The top spider uses the patented design of the 190PRO tripod, which is able to achieve four angle leg settings and convert the center column to a lateral arm. The center column used in this tripod comes from the latest generation of aluminum and resin, which allows you to leave the head mounted on the center column when switching between low angle and normal shooting positions. All parts are assembled using a proven pressure clamping technology that eliminates failure-prone glue joints for greater durability and in-the-field serviceability. To make transportation easier, the tripod is supplied with a padded carrying strap that can also operate like a hook in order to hang weights from to increase the stability of the tripod during shoots in extreme wind conditions. Ideal support for all advanced and SLR analog/digital camera equipment and spotting scopes.